Finding the perfect shampoo and conditioner can be hard. We all have different hair types as well as wants and needs for our hair, but today I am reviewing two natural products that just may be ideal for you. 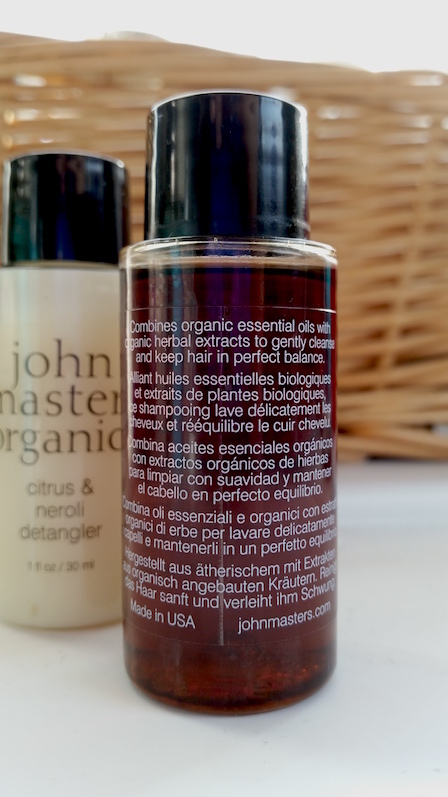 John Masters Organics Lavender Rosemary Shampoo contains lavender and rosemary extracts (as you may have guessed from the name) as well as 13 other certified-organic ingredients, amino acids and soy protein to provide you with manageable, smooth hair. It is suitable for all hair types and it also helps the hair "resist the stress of pollution, colouring and styling". Their Citrus Neroli Detangler, as you may have also guessed, contains citrus oils (such as lemon and grapefruit) and neroli oil as well as 18 other certified-organic ingredients, wheat and soy proteins and borage oil. It is particularly good for fine hair, but is also suitable for all hair types. Both products are also okay to use on coloured hair and neither are tested on animals. Neither contain any SLS, parabens, artificial fragrances or colours, GMOs, DEAs, MEAs or TEAs. At the moment I have two travel-sized 30ml bottles, but the Detangler is a product that I have been using for a while, so this isn't my first try with it. The full-sized bottles hold 236ml of product each. The Lavender Rosemary Shampoo is a dark brown in colour whereas the Citrus Neroli Detangler is a pale yellow shade. Wet the hair and apply the required amount of shampoo and massage in. There isn’t much of a lather, so it can be a little difficult at first to ascertain whether or not you have used enough, but after a few uses you’ll get to know how much you find sufficient for your hair type/thickness. For my short, fine hair, I need to use a little more shampoo than I normally would, but this could mean that you may need more if you have longer/thicker hair. Once massaged in enough, rinse thoroughly. Apply the Detangler to the hair, focusing on the ends. Leave in for 1-3 minutes and rinse throughly or alternatively you can use it as a leave-in conditioner. As with other shampoos that I have reviewed on this blog, I find it worth noting that if you haven't used a natural shampoo before then you may find it won't perform at its best when you are transitioning from a regular type of shampoo. This product doesn't contain any harsh ingredients like most other shampoos do, so there may be an adjustment period where your hair may become greasier than usual. If this does happen, be patient and try to ride it out before deciding that this isn't a worthwhile purchase. This Lavender Rosemary Shampoo leaves the hair feeling incredibly soft and lightweight. It has a relaxing scent to it as well when you are washing your hair, which is a lovely bonus. The lack of lather may be irritating to get used to if you don't tend to use shampoos that are like this, but you can rest assured that even though it's harder to tell that it is washing your hair, it is in fact doing so. Rinsing is also a lot easier thanks to the lack of suds and you can tell by touching your hair whether or not you have rinsed enough. The Citrus Neroli Detangler is easy to spread through the hair and a little goes a long way. I find that I need to use more shampoo than conditioner with this pair meaning that instead of having a lot of shampoo and no conditioner, I have the opposite! As a detangler, I find this conditioner to be brilliant. Your brush simply glides through the hair with ease. If you have thicker or longer hair that tangles more easily than mine, I can't say for sure whether or not you'd get the same results, but with my short, fine hair, the results are fantastic. 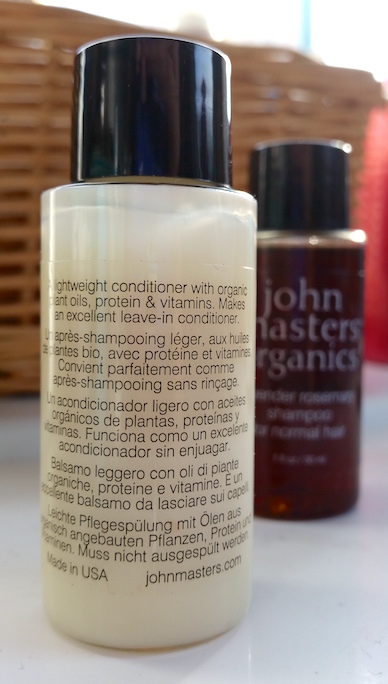 For me, I find that whilst leaving the conditioner in my hair without rinsing makes my hair look and feel soft and smooth for a while, it does make my hair feel heavy throughout the day and makes it turn greasy very quickly. When I rinse it out though, it is a conditioner that I love to use. The hair feels lightweight and bouncy and is far more manageable. Overall, I highly recommend both of these products. The only thing that I think that a lot of people will find off-putting though is the fact that both products can be considered expensive for the amount that you get in each bottle. 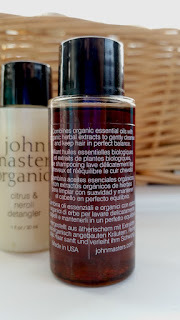 On the plus side though, you know that not only are you treating your hair, but part of the John Masters Organics philosophy is that each product is as bio-degradeable as possible, meaning that you do less damage to the environment. You can purchase the John Masters Lavender Rosemary Shampoo for £16/236ml and the Citrus Neroli Detangler for £16/236ml from Feel Unique (individual links: Shampoo and the Detangler). 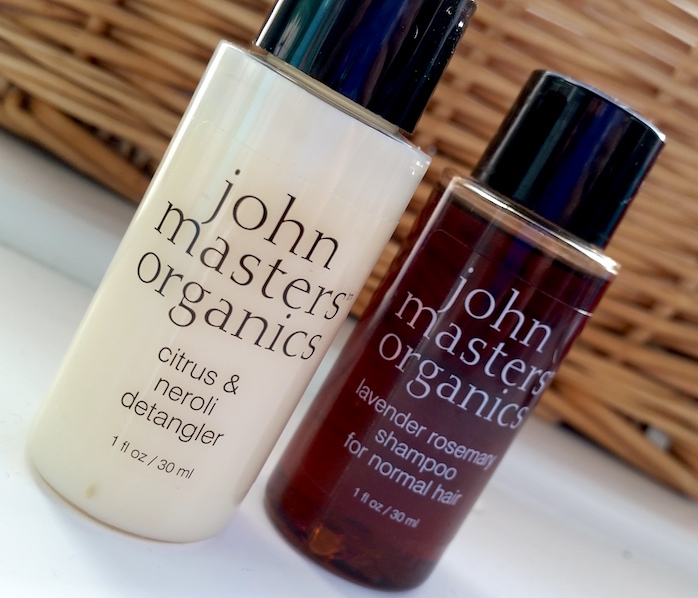 What are your thoughts on the John Masters Organics Lavender Rosemary Shampoo and Citrus Neroli Conditioner? What are your favourite shampoos and conditioners?